See Your Box ltd.: SYB. We are finalist at MassChallenge Switzerland 2016! SYB. We are finalist at MassChallenge Switzerland 2016! See Your Box has been selected among the MassChallenge Switzerland finalists, after successfully completing the second selection round at the Campus Biotech in Geneva. Only 72 start-ups over 450+ initial contenders managed to get through this second stage. Finalists take part in the 4-month accelerator. During this time, SYB will continue to innovate the real-time monitoring service industry and then present in front of the final judging commission in autumn 2016. 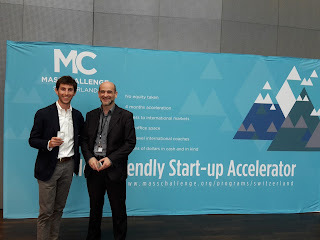 MassChallenge is an accelerator in Switzerland, connected with several hubs around the world. All these connections will dramatically expand the open innovation, collaboration and entrepreneurial ecosystem in Switzerland, as well as greatly enhance the MassChallenge network in Europe, North America and Israel.